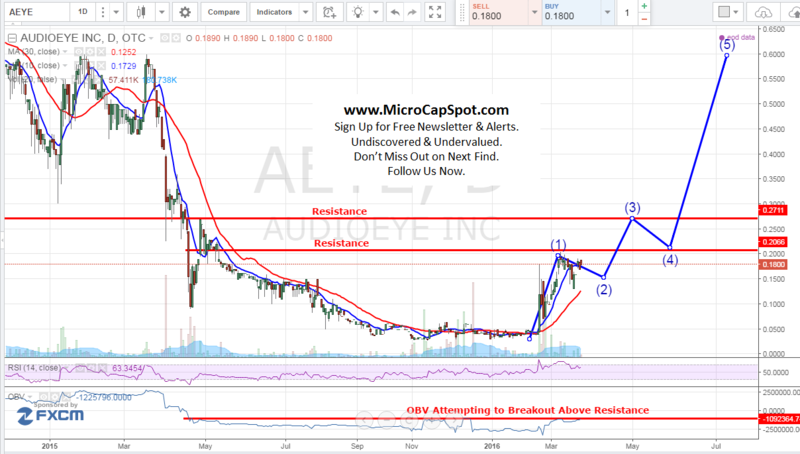 Audioeye Inc (OTCMKTS:AEYE) investors have reason to be excited with the recent business update and new announcements. The stock has been skyrocketing since mid-February and has gained over 350%. The stock broke out in a big way on the 22nd of Febraury where the stock posted gains of 300% climbing to a high of $0.17 from $0.043. The stock currently is trading at $0.18. In recent developments, Audioeye Inc (OTCMKTS:AEYE) in a business update announced that it had converted another customer that was on a trial period from the financial industry to an Ally+ Premium annual six figure contract. In addition it significantly expanded its contractual relationship with a different existing transportation company client. In other developments, AEYE’s executive chairman has acquired 750,000 shares or $90,000 worth of shares in a private transaction. They were acquired by an entity managed and owned by Dr. Carr Bettis and his family. In addition, an independent director EW Purcell acquired an additional 750,000 again at a value of $90,000. The shares were acquired in a private transaction and at $0.12 per share for both purchases. According to a recent SEC filing, the board of directors approved the 2016 Incentive Compensation Plan which is subject to shareholder approval plans to reserve 10,000,000 shares of the company’s common stock for compensation. The Compensation Committee of the Board of Directors further approved Performance Option Agreements pursuant to which to acquire shares of the Company’s Common Stock were awarded, subject to shareholder approval of the 2016 Plan, to the Executive Chairman 2,000,000 shares Target Award subject to increase up to 3,000,000 shares if performance milestones are exceeded. The Chief Executive Officer 2,000,000 shares Target Award, subject to increase up to 3,000,000 shares Performance Increase, and the President/Chief Technology Officer 1,500,000 shares Target Award, subject to increase up to 2,250,000 shares Performance Increase. Audioeye Inc (OTCMKTS:AEYE) develops media creation and content management software that enables Website owners to render their websites in complete audio format. The Company’s AudioEye allows any Website owner to offer visitors the capability to surf by sound. AEYE is currently trading at a $15 million market valuation. The company has been attempting to stage a turnaround after surging off its 52-week low. AEYE’s recent contract will hopefully be a trend versus an anomaly. We will be updating on AEYE when more details emerge so make sure you are subscribed to Microcapspot so you know what’s going on with AEYE. Disclosure: we hold no position in AEYE either long or short at the publication of this article and we have not been compensated for this article.